Here I am with another skincare review after some makeup reviews. Today's review is one that's long overdue, so my apologies go out to Etude House for that! 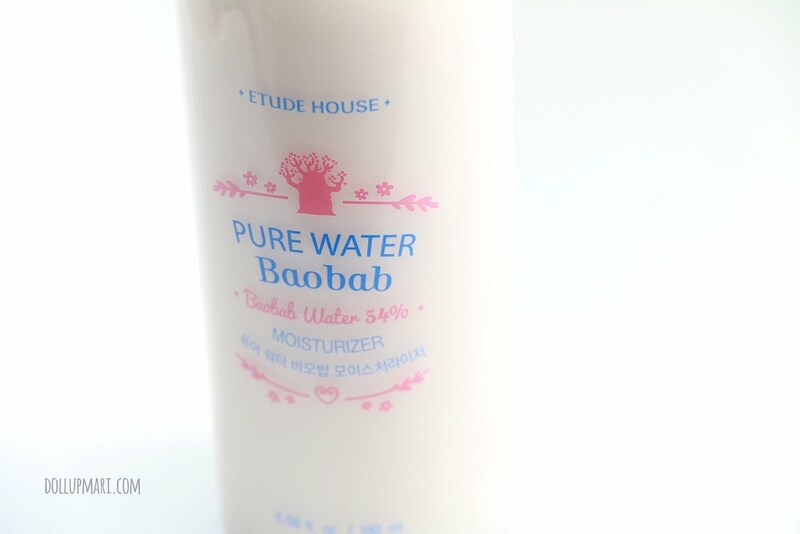 But anyways, I'll be talking about their pure water baobab. 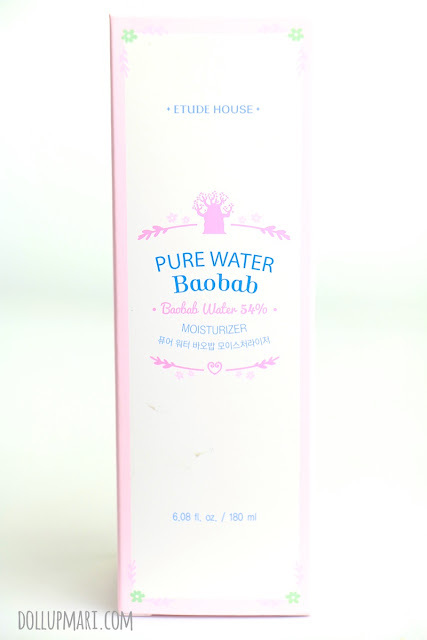 This is their pure water baobab moisturizer. 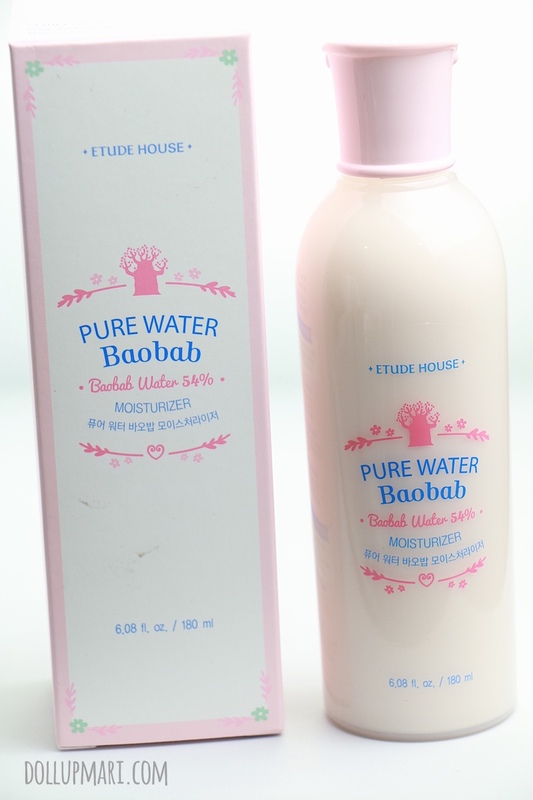 This is amusing as the unique quality that it has is that it has baobab tree water. Its main promise is extreme moisture. 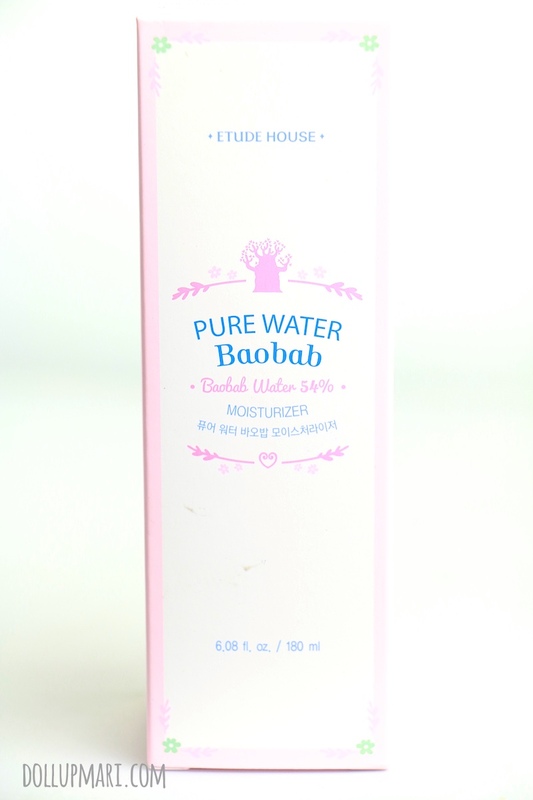 As seen on the packaging, it's got 54% baobab water. This is a very generous bottle because it's 180mL, and honestly one will need less than 3mL for a day's usage. 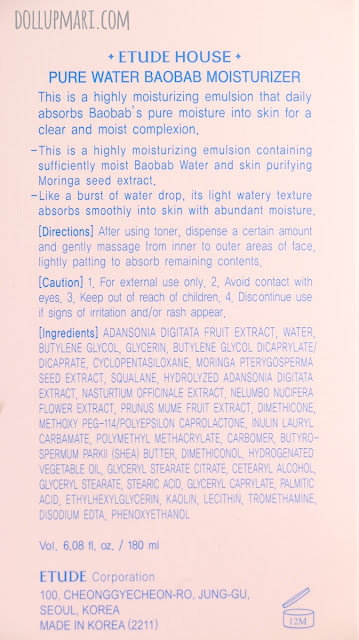 For the curious folks, here are the ingredients, and the description. And yes, it also has Moringa seed extract, and really is for moisturizing. I tell you how big of a bottle it is. It's been with me for a year now, and I haven't even consumed 1/4 of it. It's really a very big bottle. If you have lots of women in your house, this would be a good buy because it can moisturize everyone's skin for quite some time. This is amusing, too, in the sense that it doesn't come with a pump. 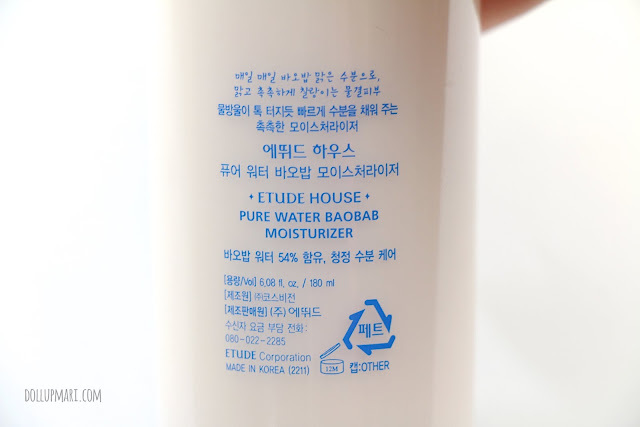 A lot of times, Etude House products come with pumps, which is why this is an outlier. It's got a plastic rim with a hole with about a 1cm diameter. And then the rim is covered with foil. And as what I was describing, it's a very lightweight milky emulsion to the skin. It has a very, very light smell, so I think this is suitable for people who have fragrance problems. And having baobab water as its main ingredient, it's very light and watery. 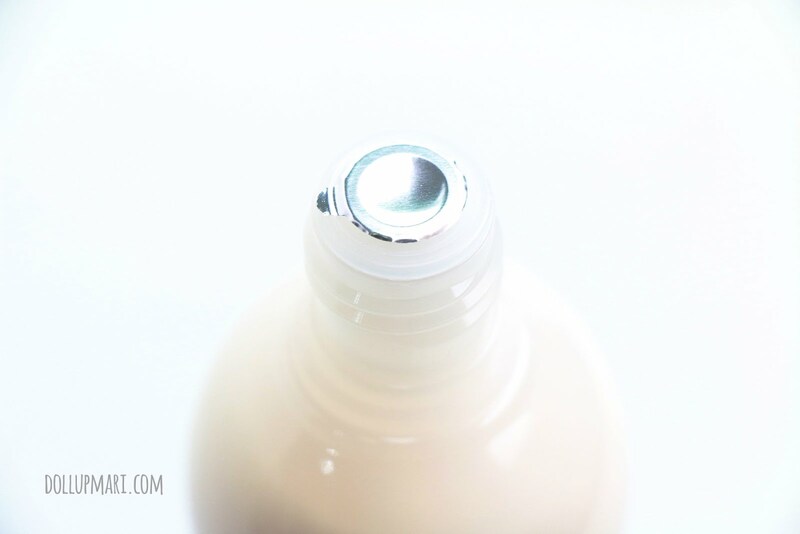 You need only very little because it's so runny and nourishing that you can apply so little and get into action in so many areas. This amount is actually an exaggerated amount because this is already good enough for my whole face and some areas of my neck. After you apply it, it still seems moist wet. 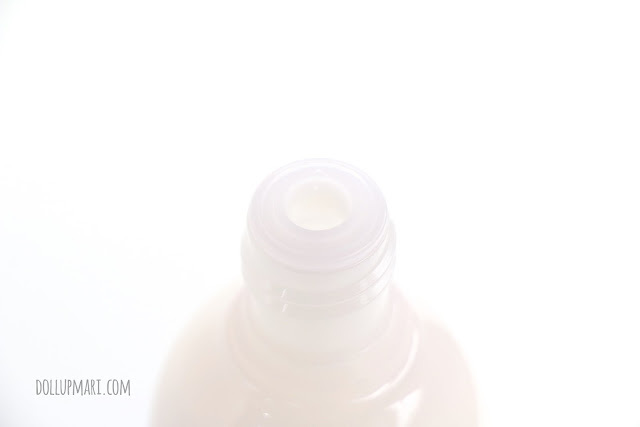 It takes a little time before the product dries up because it feels so watery. But thankfully, since this is very lightweight, it doesn't feel heavy on the face. Just imagine that you washed your face and didn't wipe it with a towel-- you won't die with the discomfort, but it does feel wet. I think I took some time to get used to this product. 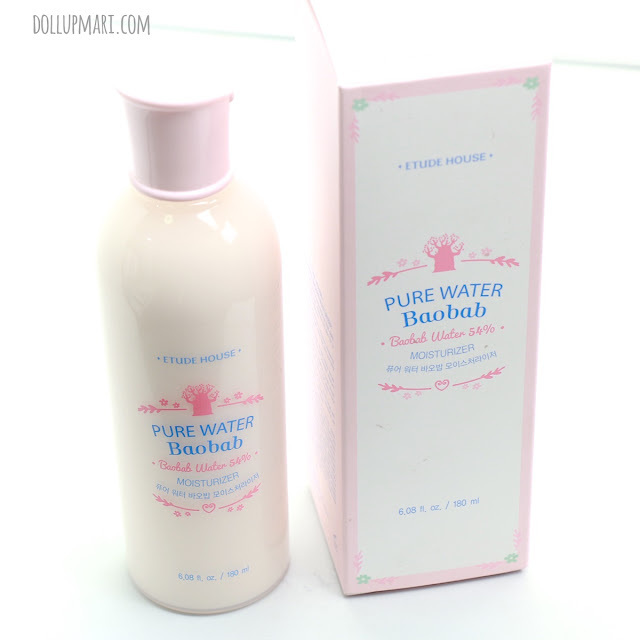 I have very, very oily skin, but this is meant for intense moisture. In the first few nights I used this, my skin was extremely oily the morning after. It was like my skin had a cooking oil factory. I tried letting my mom use it as she has more mature skin, but on the other hand, she felt that it was not emollient enough for her. So I figured that this is the kind of product for young people who have dry skin. Or for people like me, I use it when I am so stressed out that my skin is so dry that it works like a charm. It's one of the things I hold on to during hell weeks because it's one of the products that can keep me looking sane. And I don't know, but maybe the weather has also got to do with it? When I apply this and do everything else for the day in an air conditioned room, it absorbs nicely and I have dewy skin the next day. But if I proceed to a room that's hot and humid, it oils up excessively. So I think this is advisable for the colder months, or for times when you will just be in an air conditioned room like the bedroom, or even the office, too. This is definitely a good investment because this whole bottle is only Php648! I kid you not this will last you at least half a year, and that's already an extremely conservative estimate.